Thank you for purchasing The Cognitive Interviewing Blended Learning Programme. You will be sent a Username in your Welcome email and please use the password you input at the Checkout the next time you log in. 2. Now you have read the ‘Before you get started’ notes you can start your programme at any time? Click the link in the right panel and away you go! 3. Remember you can return to pick up your programme at any time, just log back in using your login details. You will be taken to your Profile page where you can see the Course you have been enrolled on. Group Leaders: To allocate Users to your 12-month licensed course please go to the Group Registration page. Click on the above Course link to view your detailed progress: which lessons you have completed and what are still to be undertaken. 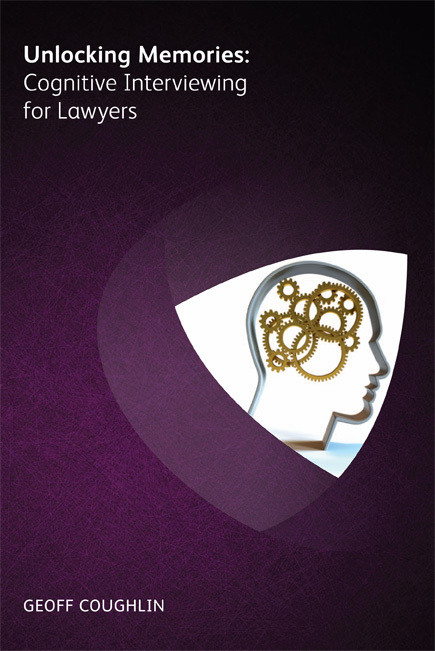 You can purchase extra copies of 'Unlocking Memories: Cognitive Interviewing for Lawyers' direct from the publisher Ark.